Photo taken in Oslo, Norway. I’m pretty sure I understand the meaning, but don’t know the literal translation. 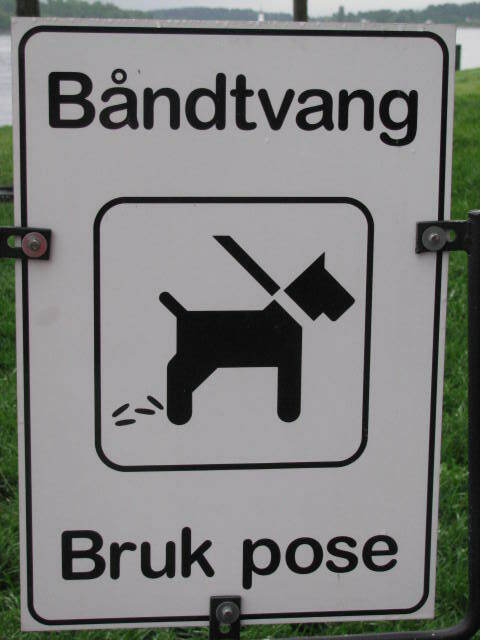 This entry was posted in Weekly Photo Challenge and tagged 50 Year Project, Dogs, Foreign, Humor, Life, Norway, Norwegian, Oslo, Photo Challenges, Photography, Responsible Pet Owners, Signs, Travel, Travel Blog, Travel Journal, Travel Photo, Weekly Photo Challenge. Bookmark the permalink. It’s obvious what it means: Beware giant dog-attacking rice. Haahaa the translation was even better than I thought. Via Google Goggles – it apparently says ‘Use the Leash Bag’ – Fascinating. Whew…I have bags on Miles’s leash so he can visit. Thanks! They have plenty of signs in London, but not many people heed them. At least not in my neighborhood. Sound advice or law. I hate when people don’t pick up after their dog. Thank goodness for pictures! I’ll definitely keep my dog out of the rice field. LOL! I’m pretty sure I know what it means too! @Zelmare, I love your interpretation, I am laughing really hard. TBM,thanks for the existence of sign, for some people common sense is not that common.